Israeli airstrikes killed two Hamas members early Saturday following a rocket attack on Israel, in the latest fallout from President Donald Trump's decision to recognize Jerusalem as Israel's capital — a development that has roiled the region and the larger Muslim world. 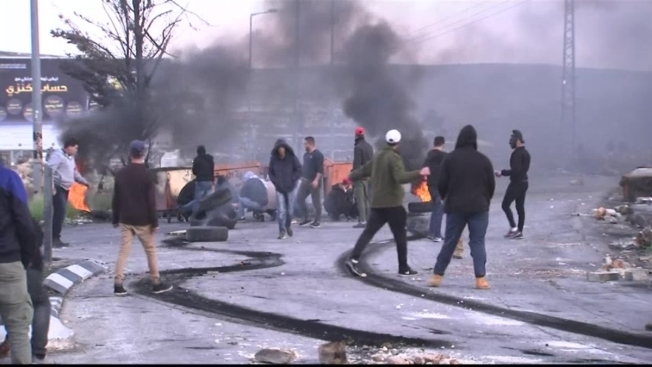 Protests and demonstrations continued across the West Bank and Gaza on Saturday on the third and final so-called Palestinian "day of rage" following Trump's announcement. The military said there were clashes in some 20 locations. In Bethlehem, Palestinians hurled stones at Israeli troops, who responded with tear gas, rubber bullets and stun grenades. The Israeli military said some 600 Palestinians were throwing firebombs and rolling burning tires toward Israeli forces. It said it dispersed the crowds and arrested six rioters. "President Trump cannot take what he doesn't have," said Zuheir Dana, one of the protesters from east Jerusalem. In a first, violence spilled into Israel itself, with Arab protesters blocking a major highway in the northern part of the country and hurling rocks at a bus and motorcycle rider, injuring two slightly. Israel has mobilized troops in case further violence breaks out. However, the clashes in the West Bank and east Jerusalem have yet to claim lives or spiral into the level of violence some had feared following Trump's move. Saturday saw a drop in the scope of the protests after clashes erupted Friday between Palestinian protesters and Israeli troops in dozens of West Bank hotspots and along the Gaza border. Two Palestinians were shot dead in Gaza and dozens were wounded in the West Bank. In Jerusalem, Friday prayers at Islam's third-holiest site dispersed largely without incident. Large crowds of worshippers across the Muslim world staged anti-U.S. marches Friday, some stomping on posters of Trump or burning American flags. Trump's announcement on Jerusalem, and his intention to move the U.S. Embassy there, triggered denunciations from around the world, with even close allies suggesting he had needlessly stirred more conflict in an already volatile region. The status of the city lies at the core of the Israeli-Palestinians conflict, and Trump's move was widely perceived as siding with Israel. Even small crises over Jerusalem's status and that of the holy sites in its ancient Old City have sparked deadly bloodshed in the past. Palestinian President Mahmoud Abbas' Fatah movement and other groups have called for mass protests while its rival, the Gaza-based Islamic militant group Hamas, is calling for a third violent uprising against Israel, though such appeals have largely fizzled as Palestinians have become disillusioned with their leaders. Arab foreign ministers, meanwhile, gathered in the Egyptian capital, Cairo, for an emergency meeting to formulate a unified response to Trump's decision. It was not immediately clear what concrete measures might be taken to counter Trump's decision, but Arab diplomats have spoken of submitting a draft resolution condemning the move to the U.N. Security Council and unspecified measures regarding bilateral ties between Arab League member states and Washington. Hamas, which seeks Israel's destruction, killed hundreds of Israelis in suicide bombings and other attacks during the second Palestinian uprising in the early 2000s. Most countries have not recognized Israel's 1967 annexation of east Jerusalem and maintain their embassies in Tel Aviv. Under a longstanding international consensus, the fate of the city is to be determined in final status peace negotiations. Israel says it hopes others will follow Trump's lead, but the United States found itself alone in the U.N. Security Council on Friday, fielding criticism from the other 14 members over the proposed move. Palestinian official Hanan Ashrawi said the council took a strong stance against "American violations of international law." "They have no mandate to give away Jerusalem to an occupying power or to violate international law in such a blatant and egregious manner," she said. While Trump's announcement was warmly welcomed in Israel as an acknowledgment of its longtime seat of government and the ancient capital of the Jewish people, it was greeted with outrage from Palestinians who considered it a slap in the face and an abandonment of the longtime American role as mediator in the conflict. After two decades of halting peace negotiations that have failed to bring Palestinians closer to statehood, some in Abbas' inner circle have begun to speak openly about abandoning the two-state formula in favor of a single binational state. In a sign of Palestinian frustration with the Americans, Abbas' political adviser Majdi Khaldi said the Palestinian president will not meet with Vice President Mike Pence when he visits the region later this month. "The U.S. crossed the red line in its decision about Jerusalem," he told The Associated Press.